An exhibit and sale at Gallery One at The Paseo features work by two generations of the Tiger family. from left Hvresse Christie Tiger, Dana Tiger and Coleman Lisan Tiger Blair’s art is on display at Gallery One at The Paseo through Jan. 2. 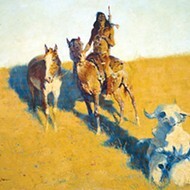 Gallery One at The Paseo’s current exhibit is a collection of works by the Tiger family. 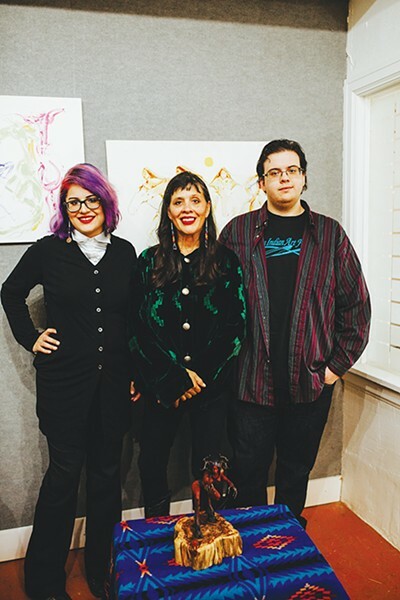 The daughter of world-renowned artist Jerome Tiger, Dana Tiger and her two children showcase a collection of works offering a genuine representation of their artistic nature that pays homage to their ancestral heritage. 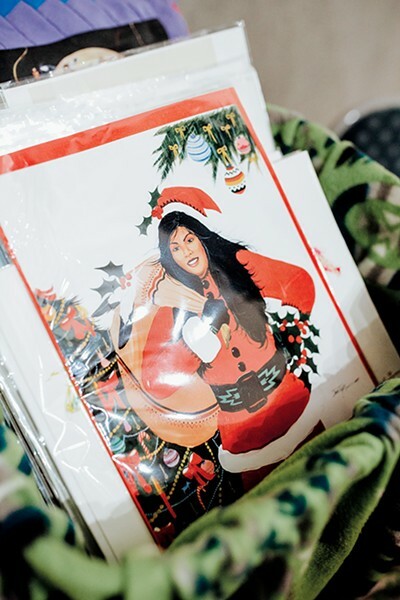 After losing her father at age 5, Tiger’s mother founded the Jerome Tiger Art Company as a means to ensure a steady source of income while maintaining the creative legacy of her late husband. Shortly thereafter, Tiger’s uncle stepped in to help raise his brother’s children, making it a point to keep Tiger and her brother actively involved in the arts. Drawing and painting from a young age, young Tiger would enter art shows on a regular basis, paving the way for a future career not so different from that of her father. Art is like a second nature to Tiger and her family, and she has worked to instill the same passion in her children, carrying forward the torch of creativity that was passed on to her years before. Dana Tiger, the daughter of famous artist Jerome Tiger, has been making art since she was a toddler. And it would appear she has been successful in this endeavor. Though only 23, her son, Coleman Lisan Tiger Blair, makes his living as a sculptor whose work has been showcased at sites as prestigious as the Smithsonian American Art Museum in Washington, D.C.
Having won a number of competitive art competitions beginning in his childhood years, Blair tries to impart his abilities to others who might be interested in forging some artwork of their own. Earlier this fall, he visited Taft Middle School in Oklahoma City, giving the students a short lesson in sculpting. 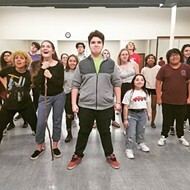 “If even one child out of that day develops that talent or that gift and becomes something of that, then it was worth something,” said Cheryl Harder, partner in the Gallery One Tiger family project. 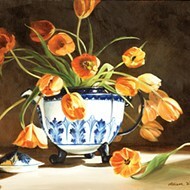 Harder and her husband, Allan, have known the Tigers for some time, having purchased their artwork in the past. She said that like Blair, Hvresse Christie Tiger, 25, is an artist whose style differs significantly from that of her mother. According to Tiger, her daughter is more fashion-conscious, combining a youthful approach with a modern flair. But that doesn’t mean the two are completely unalike. Hvresse takes after her mother in a number of ways, especially with regard to her early interest in art, a common thread woven throughout the fabric of the family line. “Before she could talk, she was carrying around a notebook and drawing in it all the time,” Tiger recalled. Now she has a child of her own, and he too appears to be following in the footsteps of the artists before him. 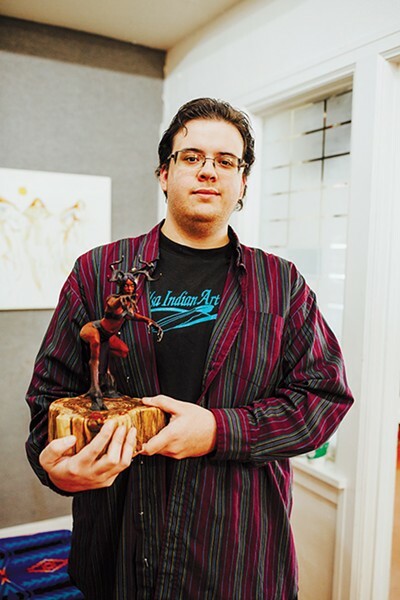 Dana Tiger’s son Coleman Lisan Tiger Blair is a prestigious sculptor with a passion for teaching others. Because she and her two children share the same studio space in Muskogee, she’s able to spend more time with her grandchild, adding to the satisfaction of her work. Tiger was diagnosed with Parkinson’s in 1999, and painting hasn’t always been easy for her. However, thanks to the newest addition to the family, she’s able to find more excitement in her daily routines. Despite wrestling with her illness for several years, Tiger has been able to maintain the lifestyle of a dedicated artist, making a living off the work she’s able to sell. Following her diagnosis, she was unsure of how long she would be able to continue as a professional artist. With this in mind, she began dabbling in abstraction and pieces that might appear more contemporary when displayed alongside her traditional works, which she continues to paint to this day. Both styles can be seen at the exhibit on display in the Gallery One exhibit at 2927 Paseo St. And viewers are in for a treat, as those who take interest in her works often express their appreciation for her unique style. But her accomplishments aren’t limited to her artwork alone. 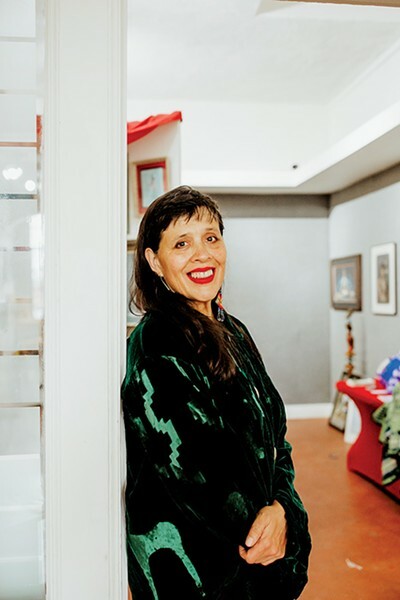 In 2001, she and her husband founded Legacy Cultural Learning Community, a nonprofit that offers camps and other activities for Native children with the purpose of educating them on the ways of their ancestors through art-related projects. 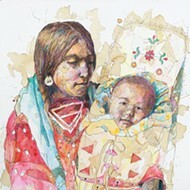 A current exhibit at Gallery One at The Paseo features art by two generations of the Tiger family. Whether she’s dealing with her art or charity or both, Tiger believes her life’s work is an important part of her culture and what it stands for. The Tiger family exhibit is on display through Jan. 2. Collectors are also presenting the works of other well-known Native American artists like Woodrow Wilson Big Bow, Robert Redbird, Archie Blackowl, Woody Crumbo and Duane Taylor. 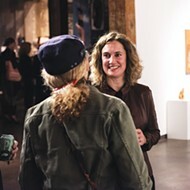 In addition to her paintings, Tiger is showcasing the work she has produced in partnership with Michael Deo, an apparel artist with whom she has recently collaborated. Many of the works will be available for sale.